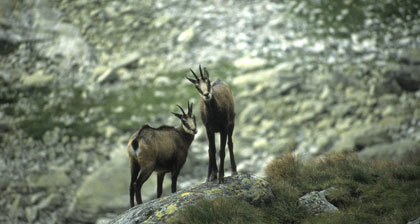 The wandering of the chamois in the Carpathians starts when the weather becomes colder, usually in the second half of October, and lasts approximately for one month. Cold weather may accelerate the starting of the wandering, while warm weather may delay it. The unbeatable world record of 141,1 CIC points was harvested in 1937 and belongs to Romania, as also 7 of the top 10 world trophies. Starting with 1990, more trophies valuing higher than 120 CIC points were harvested, but the most common/popular were the ones over 110 CIC points for he-chamois and over 105 for chamois. Chamois season for trophy chamois October 15th - December 15th, selection chamois September 1st -December the 15th.